Horror movies have always been my favourite genre of movies. I remember watching horror movies at my friend Carla’s house when we were about 7 or 8 years old. They were R rated movies so we probably shouldn’t have been watching them, but we both loved scaring ourselves! Since then they have been my movie of choice anytime we go to the theatre or to rent a movie. I think I must actually like scaring myself! I made a list of my top ten favourite horror movies. These are ones that have stuck in my head years after I watched them! 1. Halloween (1978): This movie was one of the first horror films I watched when I was young. 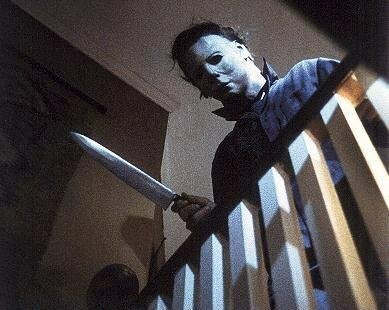 Michael Myers, the manaic killer, who goes on a rampage on Halloween night, still scares me to this day. I cannot watch this one alone because it freaks me out! There’s something about that eerie mask he wears and that bone chilling music. 2. Paranormal Activity: I saw this one last year and it terrified me. I was scared to even go to the bathroom alone after it was over! I know it’s a good movie when it has that effect on me. I think the reason this one scared me so much is because it was about demons and it was shot in an amateur style making it seem like it was a true story. Do not watch this one alone. 3. The Ring: After watching this movie, I actually had chest pains because my heart was beating so hard! 4. When A Stranger Calls Back (1993): The scene at the beginning of the movie gives me the chills! It is a sequel to the 1979 movie When A Stranger Calls. 5. Candyman: Whatever you do not say his name three time in front of a mirror! This movie was another one that scared me. I think it goes back to when I was a child and we used to scare ourselves with those Bloody Mary stories about saying her name 3 times in front of a mirror- yikes! 6. Hostel: This movie did not really scare me, but sure grossed me out. Plus, the plot was really unique! Young American tourists are kidnapped in Eastern Europe and taken to some kind of underground facility where rich people pay to torture them. Some of the scenes are pretty disturbing to watch and I had to turn away! 7. 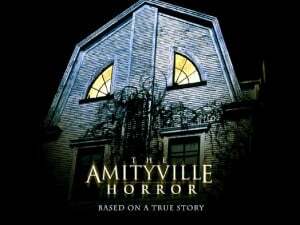 The Amityville Horror: Apparently this one is a true story which adds to its scare factor. Think big old house, evil spirits, lots of flies and some scenes that made me jump. This is another one I refuse to watch by myself. 8. Jeepers Creepers: This one was so good! A demon called the Creeper is only resurrected every 23 years to eat for 23 days. His choice of food…human flesh- eek! I would even describe it as campy. 9. Poltergeist: “They’re here!….” Those famous words from little Carol Ann to signal the arrival of the spirits in her home are the first thing that comes to mind when I think of this movie. I also remember that freaky tree that breaks through the window and attacks the boy. I watched this one when I was a kid and it scared the pants off me. John and I watched it and the sequels last year and it still gave me chills. 10. Pet Semetary: People and animals returning from the dead…eek! There is one scene that sticks with me that I cannot get the image out of my head. The sister Zelda who is sick with meningitis and how freaky she looks especially when she attacks her family. The little boy returning from the dead is also pretty creepy. Have you seen any of these movies? If so, what did you think? What horror movies would you include on your top ten list? I would have to say your top ten fav list is almost the same as mine. I still have to watch “Paranormal Activity”. AH! Pet Semetary! I totally grew up watching that pretty much daily. Zelda used to give me nightmares!!! I love this list! This reminds me, I was going to put a list together of the most cheesy Halloween / scary movies! I recently purchased some old movies just for fun.. they were SO awful! We ended up laughing more than being scared. On the list were Killer Tongue, Jack Frost and Ice Cream Man. If you google them, you will get a laugh at how silly these are! I like all of these movies, I think I would replace Hostel with the The Boogy Man The Older Boogy Man, it’s much better then the new one. I also loved Dark Secret Of Harvest Home starring Bette Davis, that was a Super Great Movie for it’s time. Wish it would come on TV. I agree with The Ring, Amityville Horror, and Poltergeist. Paranormal Activity is one of those movies that wasn’t scary when I watched it (mostly because of the people in the theater whispering “oooh, this is all real, you know?” and making me laugh) but when you’re sitting alone in the house hours later, starts to freak you out. The Shining would be on my list, that movie really creeped me out! Oh, and Rose Red. I actually jumped out of bed screaming after watching that, and I never do that! Lots of horror classics here! I haven’t seen many of these all the way through (yes, I probably am the only one in the northern hemisphere). “Poltergeist” was excellent & I recently watched the remake of “The Amityville Horror” & I couldn’t stop watching. One of my favorites is “28 Days Later,” it’s beautifully filmed. I recently watched “The Shining” (again, I am probably the only one in the northern hemisphere to have not seen it all the way through). I really wish that I hadn’t waited so long to see it, it’s an amazing film. i have always been a fan of freddy. nightmare on elm street. the remake isn’t to bad either. Some interesting picks on your list. Mine would look a heckuva lot different, though. I am not a fan of Poltergeist–at all. And I found Pet Cemetery more amusing than frightening in how terrible the acting was. For a Stephen King adaptation, I might go with Misery, but don’t hold me to that. Gotta say Paranormal Activity ranks high with me too. Along with Let the Right One In and The Orphanage. Scary stuff I highly recommend. I enjoyed every single one of these at one time or another. Great list.